Yes, a review of a bidet! It’s a fountain, really. It delivers a spray of water that cleans the nether regions after going to the bathroom. The issue of bidets came up in our family after my 9 year old returned to the bathroom for a “second wipe.” She said she had gotten tired of wiping the first time around and just gave up, but she felt uncomfortable and needed to go back in for a second try. Yeh, kids, yuk. But ‘cha gotta love ’em. But that incident reminded me of when I was 9. My dad was stationed in the Philippines. In our bathrooms we had a bidet. It was a little seat-like thing next to the toilet. After going, we would move over to it and wash our rear-ends with water, dry, and be done with it. I told my daughter about it. She loved the idea. I had always wanted to have try one again. So we went on the search for a bidet solution. (BTW – my wife thought we were both crazy). Our bathroom, and our budget, ares quite modest. Not much room for extra stuff in either of them. A free-standing bidet was not practical. But what we did find was a variety of bidets, available here in the US, that attach to existing toilets. The one that peaked our interest the most was the Joy Bidet HC-3. The company was kind enough to send us one so we could take a look and review it here on CP. First of all, the basics: The Joy Bidet HC-3 currently costs $59.95 and is available directly from Joy Bidet. The company has several similar models. This one has connections for both hot and cold water, and two nozzles… one aimed for men, the other for women, all adjustable by dials. The installation was very easy. Basically the bolts that hold the toilet seat to the toilet are undone, the bidet is placed in-between the toilet seat and toilet, and the bolts go back in. 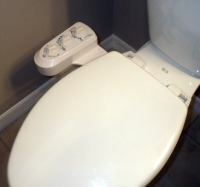 For the cold water connection, the line feeding water to the toilet reservoir is disconnected and a fitting with a tube that goes to the bidet is connected, then the line reconnected. The hot water line for the bidet is a little more work, as it attaches to the hot water line under the bathroom sink. But it’s not difficult. When you’re done, you have something that looks like this (image to right). It’s rather funny when guests see it, they say it looks “space-agey” and want to try it out! When they do try it out, they… just like everyone in my immediate family did, start out by turning it on too strong. It takes a light touch, a slow turn of the dial, at first. Once you do get used to how far to turn it on, it is very comfortable and surprisingly… accurate. Those in my family that use it regularly report that they feel cleaner. Besides being cleaner, there’s less wiping and it’s just easier…. after you get used to it. 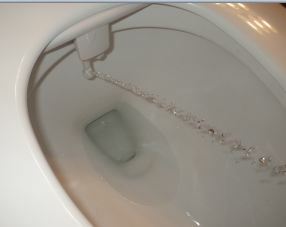 The Joy Bidet HC 3 in action! I wouldn’t say there’s a learning curve exactly. But a bidet does take some getting used to. Both me and my 9 year old like it a lot. My wife… she’s still not completely sold. 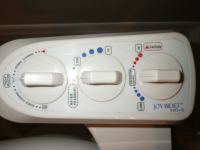 We’ve been using the Joy Bidet HC-3 for just over three months now and it is holding up well. No discernible wear or weak points. We do just use the cold water setting. It’s fine, comfort-wise. Though we might feel different if we were in a cold weather environment. The hot water just takes too long to get to our bathroom. That would vary from house to house, of course. Running the hot water in the sink until the hot water arrives would be a solution. Running the bidet in cleaning mode until the hot water reaches it is also an alternative. First dial adjusts to boy, girl, and nozzle cleaner. The middle is water pressure. The third is temperature. We have tested the bidet on two different toilets and tried a variety of seats with it. The only seat that it was not compatible with was the cheap one that came with our new toilet. The way the bidet fits, it does raise the back of the toilet seat about a half an inch. The seat that was included with our new toilet was blocked from laying all the way down by lip of the bidet. Four other seats we tested with it all fit. Before trying out the Joy Bidet HC 3, we did wonder if cleaning it would be an issue. It hasn’t been. It doesn’t get anything on it. The mechanism is well out of the way and the nozzles retract when not being used. They have stayed clean – though there is a self-cleaning function that can be used if needed. Ok, let’s turn this over to you! First of all, have you used a bidet? What did you think of it? Second, have you use a Joy Bidet HC-3? If so, what’s you opinion of it?